It seems that the Handyguys are in a bad mood this week due to terrible service at the local home center. Â The poor service, coupled with traveling security salesmen offering “free installations,” created some cranky Handyguys. First up are the stupid self check-out registers at the home center. 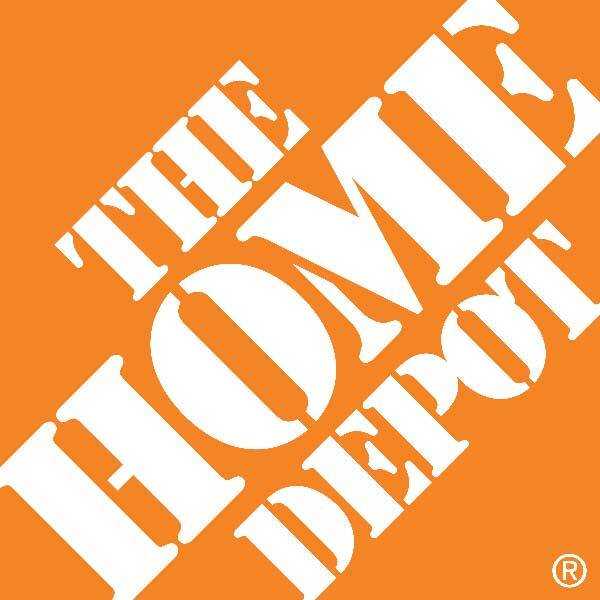 Both Lowes and Home Depot the major US home center chains deserve blame. This cost cutting trend supposedly frees up personnel to help you load your car. But if you need help loading product in your car, you probably can’t navigate it through self checkout (let alone getting it on one of those scanners!). It is not as though the “displaced” cashiers are out on the floor helping you with that crazy plumbing problem in your house. Brian shares a story about visiting a home center near his office with a simple purchase and NO human cashiers in sight. Â TheÂ 4 self checkout stations were slowly processing the customers who had smaller goods to scan. The machines were scanning but with bill acceptors rejecting bills, machines balking about what is and isn’t in the bagging area, there was an increasingly long line. When Brian finally had his turn to scan his long boards, there was no one to help when the scanner began nagging about unexpected items Â in the bagging area. All four stations had people grumbling, the lost attendant was grumbling and trying, unsuccessfully, to help someone out. The whole experience was so frustrating that Brian just left and went to a different home center! As a goodbye, the attendant yelled for Brian to put the items back on the shelves! 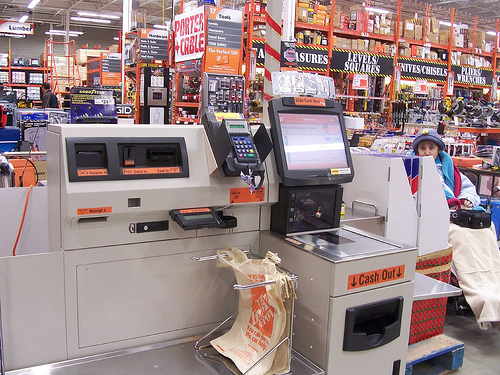 Well, wouldn’t you know, the other home center chain that Brian went to has just installed self checkout too!!! Wake up Home Depot and Lowes. Customer service will win you loyal customers. The Handyguys would welcome anyone from either chain who would like to come on the show and discuss improvements you are making that are beneficial to customers . And what is Menards doing? We have never been to one. Both Paul and Brian were recently visited by door to door vendor pushing “Free” security systems. Every high pressure tactic in the book was attempted. The catch? About $45 per month. Paul did some research and the system can be bought and installed DIY for a couple hundred dollars. Monitoring can be had for under $10 a month for DIY systems. Â Check out Paul’s recommendations for web sites where you can purchase these systems. Ha, thanks for the home center word of mouth promotion!! My last experience was horrible because i didn’t have an option. Give me the choice at least. If I have two carts full of lumber or bulky items there is no good way to go through the self checkout. Just when I thought I’ve seen it all! A week ago I stumbled on SpyRocks.com and saw their wireless night-vision surveillance cameras hidden inside fake rocks and artificial tree stumps for outdoor home security. They actually look realistic!!! (Their website has a cool section with photos of spy gadgets and hidden cameras throughout history too). What next??? LOL! When those self checkout stands work, I am a big fan – but I don’t remember last time they worked! Have they ever? Yeah, sure I suppose they do work. I do not ever remember a time without some frustration. Self check outs do not free up workers to help in other areas. They hire less help because of it. I see no evidence of lower prices. In fact most building materials cost more at the boxes than at local lumber yards. Amen, guys. I just did a post on this same subject before I sound yours’. Great post! Mark, thanks for taking the time to comment. Great article, keep up the good work.